I have a new client page that just got access to insights (the tab at the top of your page where you can look at your stats, you need 30 likes to gain access) and noticed something new! How many people walk or drive past your business every day? What if you could find out more about who they are? Well, now you can – thanks to Facebook! We posted recently that insights had been upgraded. But this is new again. 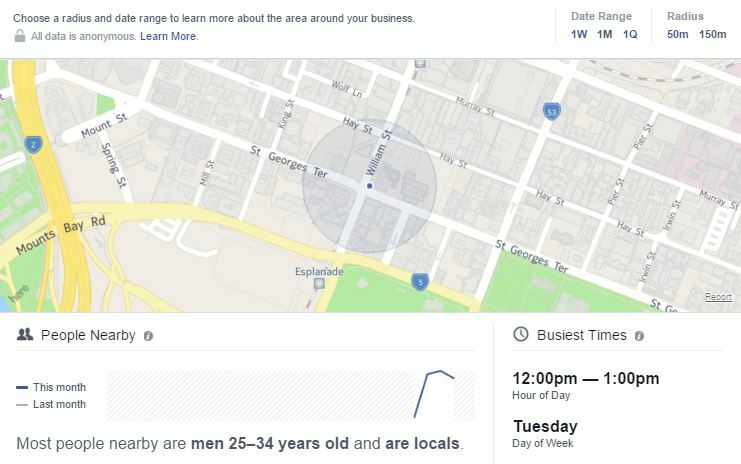 Insights into the Facebook users in a radius of your page! It’s been broken down into sections; Activity & Peak Hours, Demographic Info and Ad Performance so I’ll go through the information available set by step with some screen shots. Firstly let’s get a closer look at the map! You can choose a radium of 50 or 150 meters from the address of your business page, so the data is hyper-local. You can choose data from a week, month or quarter to look at. You can see who is the most popular demographic nearby and the busiest time for Facebook foot traffic to the area. With the People Nearby section you can look at hourly, weekly, and historical data plus view your page check-ins. And there’s no surprise there’s a prompt to create a Local Awareness ad here too. Learn more about the demographics of the people (on Facebook) who are in your local area. See their gender, age bracket and whether they are “local” or not to the area. Local is defined as living less than 200km away. As this feature was found on a new page, there’s not much here to really delve into. It can be assumed that this data will allow you to benchmark your Local Awareness campaigns by percentage and improve them with time and testing. Knowing more about the people in your business’ local area can help you make better results from your Social Media efforts. If you know which people are nearby and at what times you can create tailored hyper-local content to attract their attention. You would be able to promote a lunch special, a sale item or a happy hour, for example, to people already in the area at the time. And if this didn’t get enough traction organically, you could use some advertising budget on expanding your local reach. Not only can you create hyper-local time sensitive content for your markets, you may be able to make wider business decisions too! Say you are a local pizza store thinking about expanding to open for lunch, you could find out how many people are nearby during that period that fit your diner demographic. Very cool! With the population becoming more mobile, as marketers we need ways tap into that. 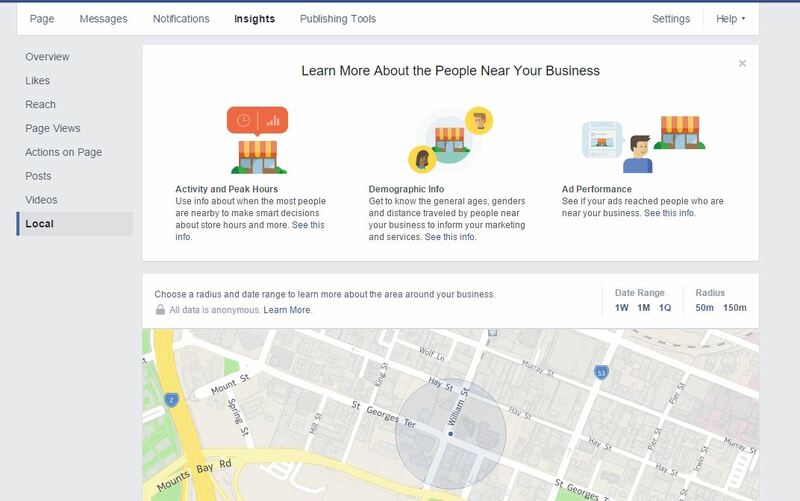 It’s less effective to target ads to people who live in the vicinity when you’re only open business hours, as most of them will be at work – being able to target people nearby as they walk past your door with a snappy sales message, a promotion or something that grabs their attention could be a game changer for your business. Facebook understands this and has started adding features such as this one, which I’m sure will be expanded in the future! What do you think about this addition to your insights? 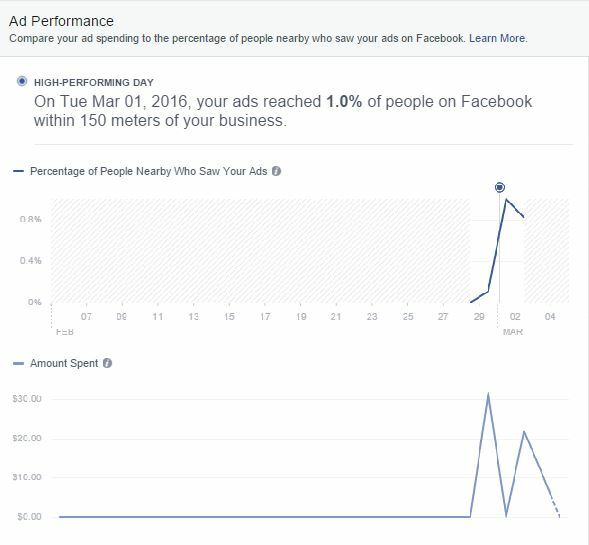 Would you be more likely to use Local Awareness ads on Facebook now? Feel free to leave us a comment, or swing by our socials – and as always, if you would like help with setting up your own Local Awareness campaign don’t hesitate to get in touch. Hi Patreon, there’s many SEO plugins as far as I’m aware! Do you mean for WordPress? There’s All In One SEO Pack and Yoast that come to mind – although it’s not really my area of expertise I’m afraid. I hope you find something that works for you.